Are you a runner? Athlete? Cross-Fit Junkie? Marathon Maniac? Surfing Fiend? Or just plain active person? In this 2 hour workshop, you’ll learn how a yoga practice can compliment your training by increasing your range of motion and flexibility, especially in the hips and hamstrings. We’ll also go over some physical alignment cues so that you understand how common yoga poses are supposed to feel and so that you can safely practice yoga in any setting. 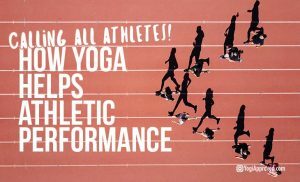 We will spend time cultivating sport-specific core strength and balance, examine yoga as mental training, and learn how incorporating yoga’s approach to mind-body integration can make you a better athlete. Your yoga practice is like self-induced physical therapy: you will learn how to take care of yourself. Practicing the poses and techniques taught in this workshop increases your flexibility, core strength, stability, balance, and physical and mental endurance while lowering recovery time and risk of injury.